SEOUL, Aug. 22 (Yonhap) -- The chief of the United States Pacific Command said Tuesday diplomacy should outweigh military means in efforts to denuclearize North Korea. Adm. Harry Binkley Harris made the remark during his meeting with South Korean Foreign Minister Kang Kyung-wha. "Diplomacy should always be the main battery, and the defense military wing should be a support," he said. Harris, in charge of the Indo-Asia-Pacific region, is visiting Seoul, along with U.S. Strategic Command head Gen. John Hyten and Missile Defense Agency Director Lt. Gen. Samuel Greaves, to discuss North Korean threats and inspect the allies' joint military drill, the Ulchi Freedom Guardian, which kicked off Monday. Kang said, "I think the alliance is a very strong one that goes forward with two wings hand in hand." The minister added she expects to meet with U.S. Defense Secretary James Mattis soon. "I'm happy to continue the discussion ... all toward further consultations on alliance issues that lie in front of us and to strengthen the alliance at a time when the importance of the alliance is as ever great," Kang told Harris. 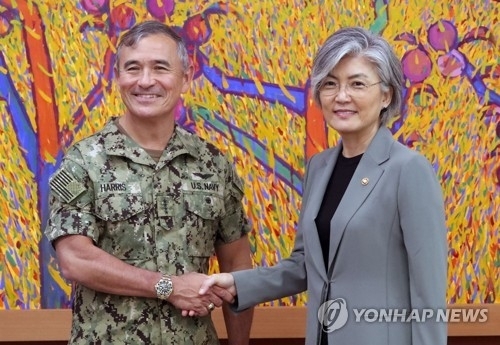 In the meeting, Adm. Harris also reaffirmed America's commitment to the defense of South Korea, stressing that diplomacy and military capabilities should go together to create a strong defense. On her part, Kang underlined the importance of South Korea's "prompt" retrieval of the U.S.-held wartime operational control of Korean troops, as well as the need to revise bilateral missile guidelines that restrict the range and destructive power of missiles made in South Korea, according to the Ministry of Foreign Affairs here. Harris expressed U.S. support for the efforts aimed at bolstering deterrence against North Korea, the ministry said. Later in the day, Kang also met a five-member delegation from the U.S. Congress, led by Sen. Edward Markey (D-MA) to discuss issues on the alliance and North Korean threats. Sen. Markey stressed that China should do more to solve issues stemming from North Korea, while expressing disappointments over the country's continued economic retaliation on South Korea for its deployment of the U.S. defense system, the Terminal High Altitude Area Defense. Kang and the delegation also delved into how the South Korean government and Capitol Hill could cooperate on the issues of North Korean refugees, human rights of Korean women and Korean families who remain separated by the 1950-53 Korean War, according to the ministry.